Corsair on Thursday upgraded its Corsair ONE small form-factor gaming PCs, giving the systems a solid mid-generation upgrade. Relative to the original Corsair ONE, the new Corsair ONE desktops feature more powerful NVIDIA GeForce GTX 1080 Ti graphics cards, up to 32 GB of DDR4-2400 memory, and NVMe SSDs paired with mechanical HDDs. Meanwhile, pricing of the new systems will be higher compared to that of predecessors with top-of-the-range model available for $2899.99. Corsair launched its SFF gaming PC this March, a bit later than many other producers of gaming hardware in this generation. To address a high end segment of the market and quickly gain market share, Corsair used everything it had up its sleeve into the Corsair ONE design, including its expertise in building computer cases with good ventilation, SFF PSUs, and custom liquid cooling. The use of an LCS and a properly vented PC case enabled Corsair to integrate rather powerful components inside: up to Intel’s Core i7-7700K as well as NVIDIA’s GeForce GTX 1080, with everything being overclocking-capable. Several months after the company began sales of its ONE-series desktops, the company is adding more powerful hardware options targeting an even higher-end segment of the market. The move puts Corsair’s ONE into the same category with boutique-built PCs, which is where some of Corsair’s rivals did not want to go. Up until recently, Corsair offered three models of the Corsair ONE priced between $1799.99 and $2399.99 (the more powerful models were branded ONE PRO). The two new Corsair ONE PRO models come with Intel’s Core i7-7700K, NVIDIA’s GeForce GTX 1080 Ti (made by Corsair’s partner MSI and running at up to 100 MHz higher when compared to NVIDIA’s reference design), Corsair’s 480 GB NVMe SSD (previously Corsair’s ONE came with only SATA drives), as well as a 500 W 80 Plus Gold PSU. The new ONE PRO versions are are available for $2699.99 (with 16 GB of DDR4) and $2899.99 (with 32 GB of Vengeance LPX DRAM). Meanwhile, the Corsair ONE PRO priced at $2299.99 also got an SSD upgrade: it now comes with an NVMe drive. 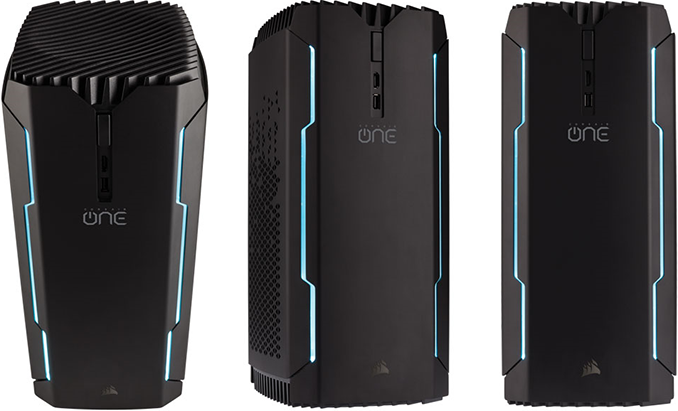 From an architecture point of view, the new Corsair ONE PRO models are exactly the same as as their predecessors: they come in the same 12L aluminum chassis with a liquid cooling system featuring two loops, a Mini-ITX motherboard based on Intel’s Z270 PCH, a custom SFX PSU and only one exhaust fan. The only things that have changed are performance and prices. Since all Corsair’s ONE PRO systems use a bunch of standard desktop components, all existing desktops can be upgraded with new SSDs or specially qualified Corsair Vengeance LPX DDR4 DIMMs. The new Corsair ONE systems are available in North America, Europe and Australia directly from the company or its partners. The upgrade kits for the existing Corsair ONE PCs will hit the market sometimes later. Current Gen GPUs are a lot less power hungry than last-gen ones were.